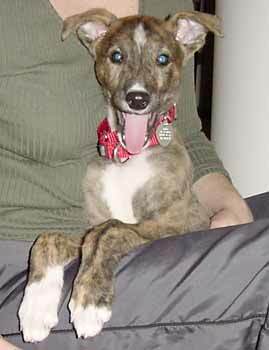 Cassie is a 3-month-old beautiful brindle puppy, born approximately November 2, 2002. 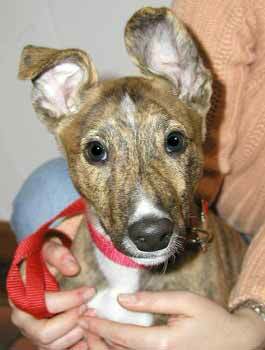 Cassie has a white star on her forehead and 4 white paws as well as a white chest and throat. 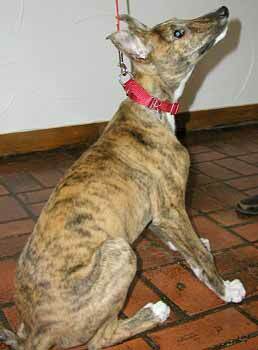 She has more energy as you can imagine for a little greyhound puppy. 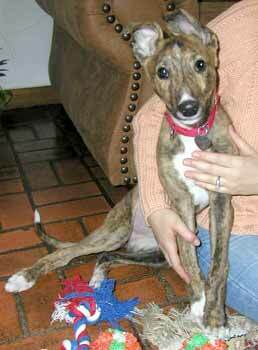 Her foster mom and dad, Meg and Troy, have already taught her to sit, and she is crate trained. She is very intelligent, communicative and is a talker. Cassie has tons of spirit, and loves to run, play and chew! She will receive the last of her puppy shots around March 1, 2003.